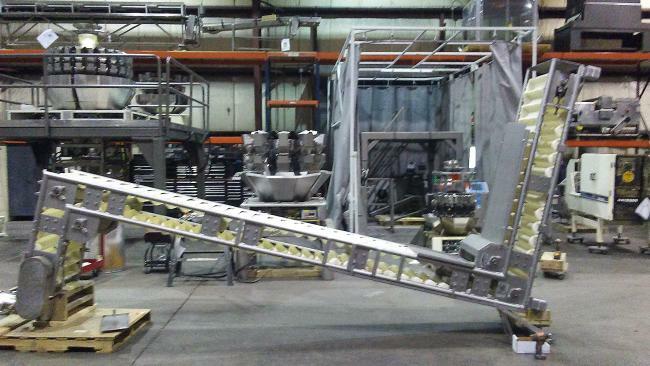 Used Aseeco Bucket Lift Conveyor, M# ALS-0-18-CP, 18" X 4" X 3" Buckets, 15' Tall, 90" Long For Sale! Used Aseeco Z Bucket Elevators for sale! Buying used Asseco Bucket Elevators is the best way to greatly reduce start up costs. Buying used Asseco Bucket Elevators is also a great way to update your equipment and to achieve faster speeds. Our used Asseco Bucket Elevators can be refurbished and ready to run. We are your used Asseco Z Bucket Elevators experts! Used Aseeco Bucket Lift Conveyor, M# ALS-0-18-CP, 18" X 4" X 3" Buckets, 78" in feed length, 13'10" discharge height, and 33" discharge length for sale!! !